This is the latest installment in the Expat Chronicles of The Swiss Family Cuthbertson. One of the first things that struck me when I moved to Zurich was the preponderance of small children on the streets, on their own, walking purposefully. Not small in stature (those would be the gnomes making gold in the Swiss bank vaults), but small, small. Young, immature, of tender years, those without sufficient street smarts. In Switzerland, children from the age of five often walk to school without their parents. When I commented on this to our relocation manager, she said that Swiss children are indeed encouraged to be independent from a very young age. Once she said that, I noticed that people don't hold their children's hands crossing the road. 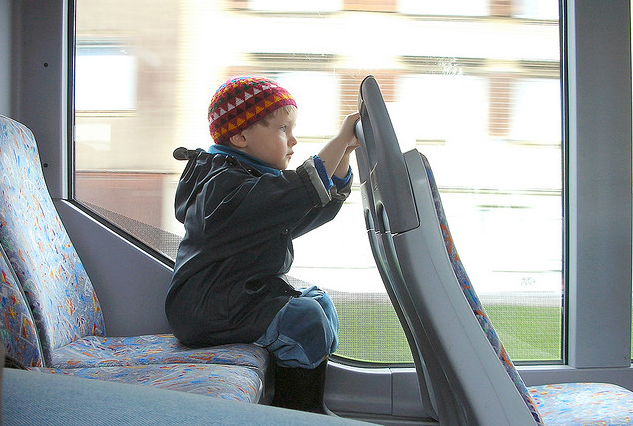 Children aren't driven to school or accompanied on public transport. And this autonomy starts before school-age. Swiss parents don't hover around the playgrounds waiting to intercept Moritz on his way to thump Reto for using his sandpit spades. Children are left, by and large, to get on with it. It's the opposite of helicopter parenting. The nurseries (and, no, I don't mean schools) even organize camps for children as young as two. These are holidays which the children go on from Monday to Thursday with the nursery staff — and they have NO CONTACT with their parents during this time. Now, the non-parents reading this are probably thinking, “So what? Three nights on their own — free babysitting — why not enjoy it and go out for dinner?" Let me elaborate: three nights on their own, not being able to articulate their precise needs, still wearing nappies, under threat of attack by wild pigs, unable to spot a tick bite, with people who are not their parents, surrounded by scary gloomy trees (did you not see The Blair Witch Project??). Perhaps the merits of independence are to be seen in a country with a spectacularly healthy economy, low unemployment, above-average sporting achievements, and a teenage population with an eerie respect for authority (despite their national dependence on Red Bull). I was once on the train when a gang of noisy teenagers got on (complete with requisite Red Bull cans). My London-trained hackles rose as I wondered what hijinks and escapades would be played out in my part of the carriage. This is what happened: They got on the train, came down the aisles, sat down, and spread out newspapers on the seats. And ONLY THEN did they put their feet up. I think this idea of independence is linked to the Swiss concept of self-responsibility or Selbstverantwortung. If you participate in an activity — from driving a car to skiing to hiking to bicycling — if you're out there, you implicitly accept the risk of an accident, and it's up to you to inform yourself of the dangers and to get the proper insurance. Everyone is required to have insurance: personal, medical, life, travel. It seems that here you don't sue if you fall down an unmarked well whilst out walking the dog. You should have researched your route properly (and perhaps been in touch with Skippy, too). It's the antithesis of the nanny state — there are no CCTV cameras watching, there are no Health and Safety manifestos, there is no Respect Tzar. You alone are responsible for yourself and your well-being. And that starts with getting yourself to school, aged five, without a chaperone. Lou is an Irish expat living in Zurich, Switzerland. She travels for the food. Always the food.